She was not please with my presence when I came out of the door. She made noises to warn me although she perched way on top. She would not fly away as the bird usually does. So I kept on watching her and talked to her softly. She led me to her nest, which was under the roof and on top of the pipe about few steps away. Her instinct was to protect her eggs by making noises, but her effort went the opposite when she showed off her nest :-) See more photos of this gorgeous Black-Chinned Sparrow! 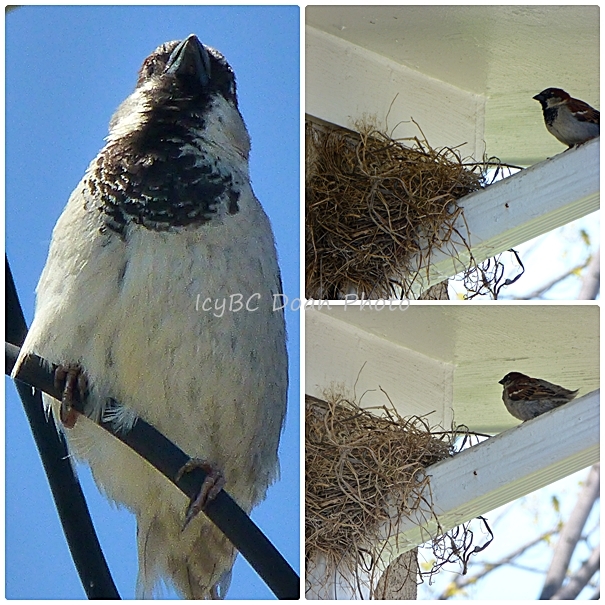 Linking up with Camera Critters and the Bird D'Pot ! haha! she must have not known that her noise is inviting you even more and her nest is the more attractive for all of us to take picture. Icy, she really let you get great pictures. Seems like a pretty large nest for a tiny bird. Wonder how many eggs they lay. Off to India June 1, hopefully this time for six months. My first grandchild, Harper, born April 14 - a girl, most welcome in a family top heavy with males! Cute shots of your sparrow!